WALL MAP OF ATLANTA, GA REGION - PROFESSIONAL MAP RESOURCE FOR THE METRO REGION OF NORTH GEORGIA, A LARGE LAMINATED WALL MAP PERFECT FOR EXECUTIVE OFFICE, REAL ESTATE, SERVICE DISPATCH, GENERAL ROUTING, PLANNING, MARKETING OR SALES TERRITORY MANAGEMENT. CHECK OUT THE DETAIL...Major streets, highways, exits, cities & towns, counties, 5-digit ZIP code boundaries, plus Downtown-Buckhead inset on right side with city/zip index. 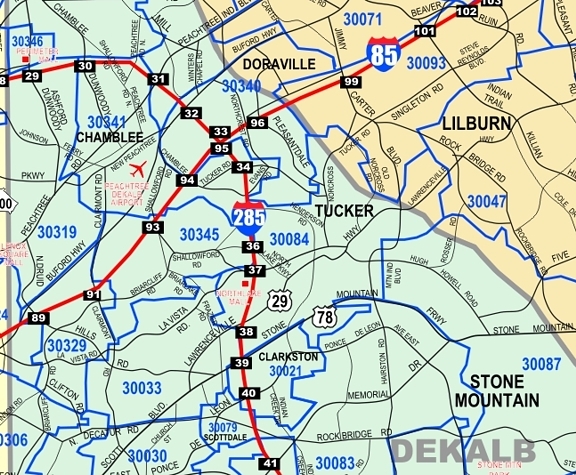 Business Planning & Zip Code Wall Map Metropolitan Atlanta Region covering over 40 Atlanta surrounding counties, Interstates with exit numbers, federal and state highways, county roads, primary streets, Atlanta area suburbs, North Georgia communities, major landmarks/ points of interest. Need to take up less wall space? 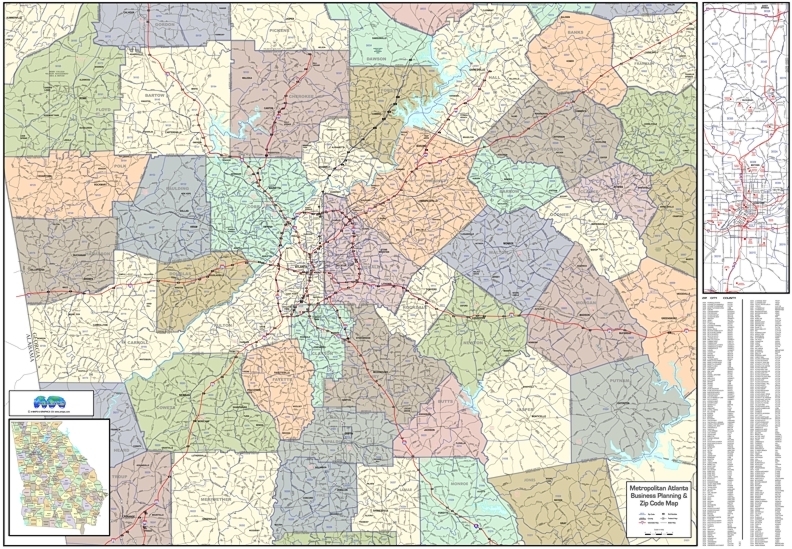 MEDIUM-SIZED ATLANTA REGION WALL MAP- 54x35"